Anthony Hudson would rather be with his Newport County team playing Darlington on Tuesday than with former club Tottenham Hotspur at Real Madrid. The Exiles boss swapped preparing for Tuesday's Champions League quarter-final clash at the Bernabeu with Spurs to ready his new team for Darlington. Hudson will take charge of his first Blue Square Bet Premier game on Tuesday as Darlington visit Spytty Park. "I wouldn't want to be anywhere else," insisted new County Hudson. The 30-year-old was confirmed as full-time successor to Dean Holdsworth, who left for League Two Aldershot in January, on Friday after a personal recommendation to County chiefs from Spurs boss Harry Redknapp. The man tipped to be the next England boss also took time out preparing for Tuesday's first-leg last eight showdown with Spanish giants Real Madrid to compare the young County boss, who had been Tottenham's reserve team coach, to Bernabeu chief Jose Mourinho. Both two-time Champions League-winning coach Mourinho and Hudson, the son of former England and Chelsea midfielder Alan, started their coaching careers at a young age after failing to make it as a professional footballer. 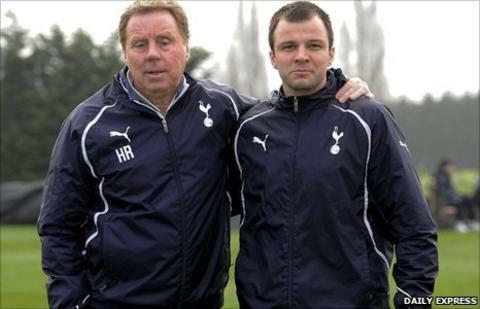 And Hudson will take the next step in his coaching career on Tuesday as the highly-rated former member of Redknapp's Spurs backroom staff manages his first game in English football rather watching old club Spurs take on Real Madrid. "It's funny, but I wouldn't want to be anywhere else than playing against Darlington," said Hudson. "There's a bigger picture and I believe I'm going to get this club into the Football League. "It's not just going to happen next summer, our journey into the Football League has started already and part of that process is playing Darlington on Tuesday. "It is fantastic that Spurs are playing against Real Madrid and it's going to be an amazing experience. "But I tell you what - I don't want to be anywhere else other than with the team, getting to know the team more, being out there against Darlington, just getting to know the club more and the fans more. I don't want to be anywhere else. "The atmosphere at the Bernabeu is going to be amazing but I don't think it will be as good as Newport County on Tuesday." Hudson, who previously managed American minor league side Real Maryland before returning to England and Tottenham in 2010, enjoyed a memorable White Hart Lane send-off. Coaching mentor Redknapp, whom Hudson first knew during his early playing days at West Ham United when Redknapp was Upton Park boss, gave him a glowing tribute as he compared Hudson to 'Special One' Mourinho. "On my last day I went to thank Harry for all he's done in my time there," said Hudson. "And he was really pleased I got the job. And Harry said to everyone in the office out loud "see that lad, he's going to be the new Mourinho" and I just started laughing. "It's funny. Mourinho is an absolute legend and as a young coach and a young manager, there's so many people I'm trying to learn from. "But I've got to be me. I can't try and copy anyone or be anyone. I'm comfortable with that. "But at the same time it was very, very flattering. But I don't get carried away with things like that." Hudson has not brought any managerial assistants with him to Spytty Park as he will have help from the current backroom staff such as coach Wayne Hatswell and director of football Tim Harris. Harris had been Newport's caretaker boss since Holdsworth's departure and guided County to back-to-back wins. So should Hudson inspire his new team to beat Darlington on Tuesday, eighth-placed County would have an outside chance of pushing for the end-of-season play-offs and a shot at the Football League.